Senior pitcher Gary Grosjean fires a pitch to the plate during Truckee’s 2-1 loss to South Tahoe at Greater Nevada Field. 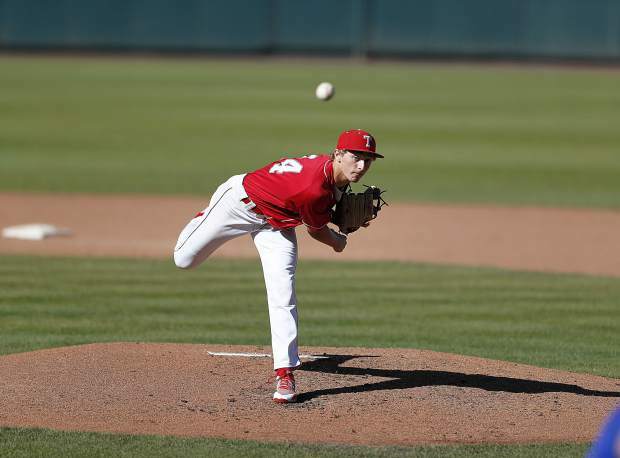 Grosjean tossed a no hitter during Truckee's five-inning victory over Lowry on Friday, May 10. The Truckee baseball team concluded the regular season on a six-game winning streak after taking a trio of contests against Lowry last week. With the wins the Wolverines will enter the Class 3A Northern League tournament as the No. 3 seed, and will play No. 6 Spring Creek on Thursday, May 10 at Churchill County High School. The Wolverines opened their final series of the regular season on Thursday, May 10, and came away with a 7-2 victory. The game remained scoreless until the top of the fourth when junior Elliot Rost hit a single into left field to score a run. Lowry responded with a pair of runs in the fifth inning to take a 2-1 lead, but Truckee retook the lead an inning later after a two-out error allowed a pair of runs to cross the plate. Junior Conner Joyce then came to the plate and laced a tripe to right field for another run. Truckee extended its lead in the final inning of the game with RBI singles from senior Colin Just and junior Spencer Edmondson. Just was solid on the mound, tossing a complete game with five strikeouts while allowing three hits and two earned runs. Senior Gary Grosjean was nearly perfect the following day against Lowry to open the first game of a doubleheader, just missing out on a perfect game during Truckee’s 10-0 win. Grosjean’s bid for perfection was spoiled in the bottom of the fourth inning when he made an error on a ground ball, allowing Lowry’s only baserunner of the morning. Truckee went on to the win the game after five innings of play via the 10-run rule. Grosjean finished the game with five strikeouts. From the plate, senior Joel Estabrook had Truckee’s only extra-base hit with a triple in the fourth inning. Rost finished the game with a team-high three hits. Joyce drove in three runs, and junior Derek LaFerriere knocked in a pair of runs as well. The teams returned to the field later that afternoon, and it would take a rally in the second half of the game to propel Truckee to a 16-6 victory. The Wolverines took an early 2-0 lead off a single by LaFerriere and a double by Edmondson, but the Buckaroos rebounded with a trio of runs in the bottom of the frame. Truckee senior Tyler Ferrera led the next inning off with a triple, but was left stranded at third behind three consecutive groundouts. Lowry then plated two more runs in the bottom of the inning to take a 5-2 lead. Junior Jake Streit pulled the Wolverines to within a run in the top of the fourth with a two-run single to right field. Truckee then tied the game an inning later off an error in the field by Lowry. The Wolverines then pulled ahead off a two-run single to center field by Ferrera. Truckee distanced itself in the following inning off a sacrifice fly by Joel Estabrook and a single by LaFerriere for a 9-5 lead. Errors led to loaded bases for Truckee in the next inning. The Buckaroos then committed another error on a ball in the next at-bat, allowing for two more runs to cross the plate. Joel Estabrook then singled to score another run. LaFerriere knocked in his third run of the game in the next at-bat with a double to center field. Edmondson then made it back-to-back doubles with a shot to right field. Rost would hit a sacrifice fly one batter later for Truckee’s final run of the regular season. Edmondson finished the game two doubles and three RBIs. Estabrook also had three RBIs for the team. Streit went five innings on the hill and struck out five batters while allowing seven its and one earned run. The Wolverines will make their first postseason appearance in five years when they take the field on Thursday, May 10 against Spring Creek. The tournament features six teams in a double-elimination format. Truckee lost two of three games this season to the Spartans, but those games were close with Spring Creek taking one-run and two-run victories. The game is scheduled for 11:30 a.m. at Churchill County High School.